The transfer deadline is coming up on Monday and Arsenal have already done business, even if the holding midfielder they signed is a 17-year-old. The emergence of Francis Coquelin has taken a little heat off Arsene Wenger in terms of that position, while the center back depth has been shored up with the signing of Gabriel Paulista. So, how are the media going to manufacture a controversy now? John Cross, who I liked quite a bit as a journalist up until this season, wrote in an article for ESPN that we're too light up front, thanks to the loan departures of Yaya Sanogo, Lukas Podolski, and Joel Campbell even though all three were loaned out as they are excess to current requirements. Arsenal still have an attacking force that consists of Olivier Giroud, Danny Welbeck, Theo Walcott, Alexis Sanchez, Santi Cazorla, Mesut Ozil, Alex Oxlade-Chamberlain, Aaron Ramsey, Tomas Rosicky... nine players who can play in the forward four positions in a 4-2-3-1. Oh, and Chuba Akpom. And Jack Wilshere when he's healthy again. And Serge Gnabry. So that's 12 forwards and attacking midfielders. Funny thing is, John Cross isn't wrong in his statements about Arsenal up front; he just doesn't correctly explain it. It's not just a shear numbers game, like the article implies. Arsenal are objectively better with Olivier Giroud up top: since returning at the end of November, Arsenal have won six, drawn one, and lost one in matches where Giroud has started. Arsenal have won 11 of their last 14 since the loss to Manchester United, the day Giroud returned from his injury. Arsenal had Sanogo, Podolski, and Campbell while Giroud was out. Over the 15 games Giroud missed, Arsenal won six, drew five, and lost four. It's not a numbers game, it's Giroud's talents. Maybe it's time to start giving him credit instead of questioning Wenger for loaning out excess forwards. Arsenal will look to win three straight league games for the first time this season as they face Aston Villa at the Emirates on Sunday. The last time Arsenal aimed for their third straight, they were toothless without a suspended Giroud, and fell 2-0 to Southampton. Look for the big man up top this weekend to gauge Arsenal's character for this stretch run. There are no tremendous changes to the injury list from last week, except OH MY GOD ALEXIS SANCHEZ MIGHT HAVE A HAMSTRING PROBLEM WHY GOD TAKE ME INSTEAD. Anyway, he'll face a fitness test on Saturday. Alex Oxlade-Chamberlain is ruled out with his groin problem while Hector Bellerin might still be a doubt. My predicted XI assumes Alexis will make it because his leg would have to fall off and its bionic replacement would have to fail before Alexis chooses to sit out a football match; if he and the Ox don't make it, then Theo Walcott will probably get a start on the right. Danny Welbeck is still a week away with a thigh injury that has now kept him out for over a month. Serge Gnabry has been photographed as back in training but could use a few run-outs with the reserves before getting a first team nod. The signing of Gabriel was completed on Wednesday to give the squad some much needed depth in the center half position, but I would not expect him to start just yet, provided Per Mertesacker and Laurent Koscielny are healthy. Elsewhere, Tomas Rosicky was brilliant last weekend; might it have been enough to warrant a start in midfield on Sunday? Of course, the biggest potential flash point for controversy is in goal. Wojciech Szczesny's start at Brighton seems to indicate that he has been well and truly demoted to second string and his visible lack of confidence at times in that match further cements, for me anyway, that David Ospina is the club's current number one until he loses the job himself. Predicted XI: Ospina, Chambers, Mertesacker, Koscielny, Monreal, Coquelin, Rosicky, Ozil, Alexis, Cazorla, Giroud. Seriously, I thought he was still in France. Wait, that was three years ago? While watching the Manchester City v. Middlesbrough cup tie last weekend, I had a conversation with my girlfriend about the mysterious whereabouts of Scott Sinclair. She was correct; he's still at City. However, Aston Villa appear to be close to securing the 25-year-old's services on loan. Sinclair has played in only four games this season for City and I apparently missed all of them. In terms of injuries, Ron Vlaar has been out with a knee injury since New Year's Day, while ex-Arsenal center back Philippe Senderos has been out since November with a calf problem. Aston Villa's other long-term injury is Libor Kozak, who has been out for over a calendar year now after breaking his leg in training last January. Both Gabriel Agbonlahor and Fabian Delph missed last weekend's FA Cup tie against Bournemouth with hamstring and calf injuries respectively, but both could be in line for a return. In addition, Joe Cole, who is not still playing in France, is a doubt with a hamstring injury. Cole has made eight appearances for the Villans this season and I apparently missed all of them. Predicted XI: Guzan, Hutton, Okore, Clark, Cissokho, Sanchez, Westwood, Delph, Weimann, Agbonlahor, Benteke. illustrate this section of the match preview. With the 3-2 win in Brighton last weekend, Arsenal have now won four straight across all competitions for the first time this season. They still have not, however, won three straight in the league since the end of last season, something the Gunners could accomplish with a win on Sunday, as mentioned in the intro. In addition, a clean sheet would be their third straight in the league as well, something the club have also not accomplished since their run to the Fourth Place Trophy at the end of last season. As for Villa, well, things have been complicated lately. On December 20, Christian Benteke fired a shot into the corner of the net against David De Gea to give Aston Villa a 1-0 lead against Manchester United in the 18th minute. The Villans have not scored a goal in Premier League play since. They ended up drawing that match 1-1. They then lost to Swansea 1-0 on Boxing Day, played consecutive scoreless draws against Sunderland and Crystal Palace, lost 1-0 against Leicester, and lost 2-0 against Liverpool. Villa have just three points and no wins from their last seven league fixtures and now sit just three points clear of relegation. Villa had 10 points from their first four matches; they've earned 12 points in the 18 matches since, winning only two of them. Aston Villa have scored only 11 goals all season, through 22 matches. They are on pace to score just 19 goals in total, which would break Derby County's Premier League record for attack futility; the Rams scored 20 in their disastrous 2007/08 season. Villa's saving grace is that they've only conceded 25, tied for fifth in the league with Arsenal and West Ham. Of course, Villa have won twice in the FA Cup during this dry spell in the league, winning twice against Championship sides: 1-0 against Blackpool and 2-1 against AFC Bournemouth. Their fifth round tie will be at home against Leicester City. ...but first, Arsenal won the reverse fixture easily back in September against an in-form but under the weather Aston Villa side, 3-0. 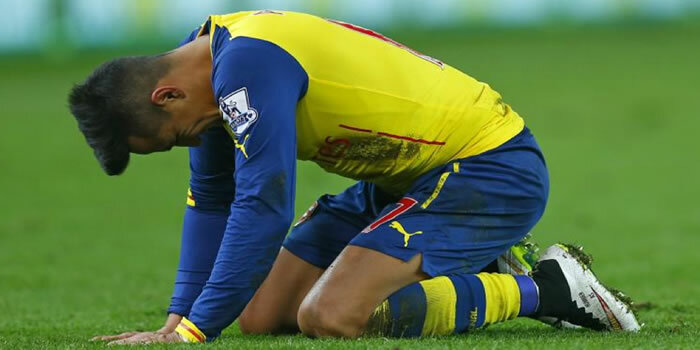 The Gunners scored all three of their goals in an exhilarating four minute span. Mesut Ozil scored the first on a breakaway, then assisted Danny Welbeck for the second. Aly Cissokho turned a Kieran Gibbs cross into his own net for the third. Arsenal finished the match with nearly 71% possession. The Villans have just three wins in their last 22 matches against Arsenal overall, but one of the wins came in this corresponding fixture last year, the season opener. You likely remember it well. Aside from the referee's decisions, which I'll get to in the following section, Arsenal led 1-0 through an early goal from Olivier Giroud before everything went downhill. Villa's counterattack was dangerous all match and drew a penalty on 22 minutes. The shot was missed but the rebound converted to equalize 1-1. Villa was given a much more controversial penalty just after the hour mark to go ahead 2-1, then the Villans scored a third in the 85th as 10-man Arsenal pushed ahead for an equalizer. 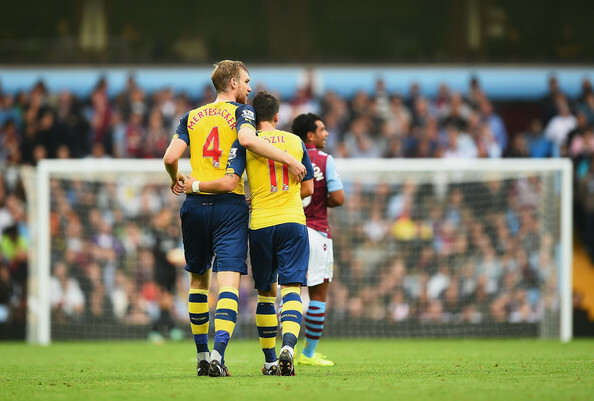 Later in the season (last January,) Arsenal won 2-1 at Villa Park. Why, FA? Just... I... I just... why?? Get your conspiracy machines fired up; the referee is Cheshire-based Anthony Taylor. Yes, the very same Anthony Taylor who worked this fixture last year. 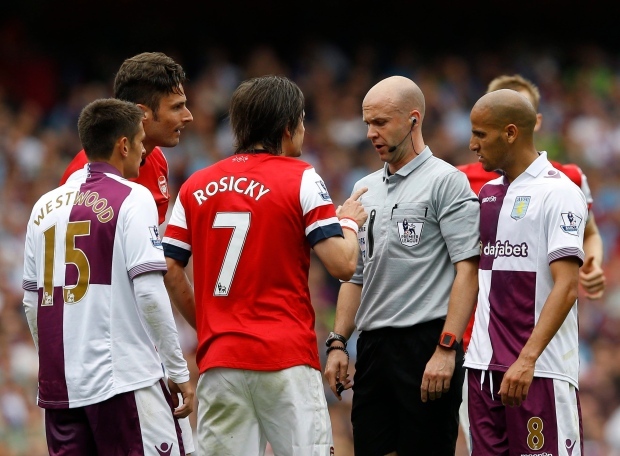 The very same Anthony Taylor who awarded two penalties to Villa, the latter of which was practically ridiculous. The very same Anthony Taylor who just minutes later sent off Laurent Koscielny for a second borderline bookable offense. The very same Anthony Taylor who was dropped from the next round of fixtures for his performance that day. Taylor was kept off working Arsenal games for the rest of last season. He took charge of a noncontroversial 1-1 draw at Leicester in August, but then was also in charge of Arsenal's 3-2 loss at Stoke in December, in which he sent off Calum Chambers for two borderline fouls but only booked Charlie Adam for putting Alexis Sanchez in a chokehold. Make of that what you will; Taylor has sent off an Arsenal player in three of the last four Arsenal matches he has worked. Aston Villa won their season opener with Taylor again this season, 1-0 at Stoke back in August. In October, however, Villa lost 3-0 at Everton with Taylor in the middle. John Painting is a contributing writer to The Modern Gooner and is a district of the city of Turku, in Finland. You can follow him on Twitter @zorrocat to ask why he's just getting his joke descriptions from Wikipedia articles selected at random now. That's pretty lazy, if you ask me.